If you are short of time, the answers to the following 3 questions should let you know all you need to about the Sonicare 2 Series. If we have missed something, let us know in the comments. If you want more detail, you can read our full Sonicare 2 Series review further down the page or watch our video review. Most certainly not, it is a fantastic electric toothbrush and is one of the best sellers in the USA, for good reason. If you are looking for an excellent value electric toothbrush, maybe your first electric toothbrush, this is an absolute must. The 2 Series is a great brush, when picked up at the right price. More often than not, the newer Sonicare ProtectiveClean 4100 is cheaper. Whilst it lacks a travel case, it makes up for it with innovative features such as brush head replacement reminder technology and a built in pressure sensor. Another alternative, with a small round brush head rather than the larger Sonicare head is the Oral-B Pro 1000. It is fairly light on features and battery life is inferior, but it cleans well. If you’re shopping for a brush within this price range, we recommend checking out our choice for the best cheap electric toothbrush. 3. Where is the best place to buy the Sonicare 2 Series? Stocked in Walmart, Walgreens, Fry’s, Best Buy, Amazon, Kohls, Kmart and Philip’s own online store there are lots of purchasing options with this brush – we have included a live price comparison of retailers below, and it’s always worth checking out eBay. In many respects this is an entry level brush because it does not boast a massive box contents and it does not have lots of different cleaning modes or features. However, it does pack in more than you and i might have thought for its price point. In fact it is hard to believe that you do get so much and I have struggled to find fault with it. It supersedes the Sonicare Essence that came before it with a refreshed design and addresses a couple of the shortcomings of the Essence. At the time of writing there are 7 different versions of the Sonicare 2 Series. 6 of the 7 are identical aside from the colour of the brush handle. The 7th variant is only slightly different in that technically the brush is the same, but the box contents is different. With the HX6218/10 included in the box is the 2 Series brush handle in Sky Blue colour along with 1 x Tongue brush and a 2oz bottle of antibacterial spray. 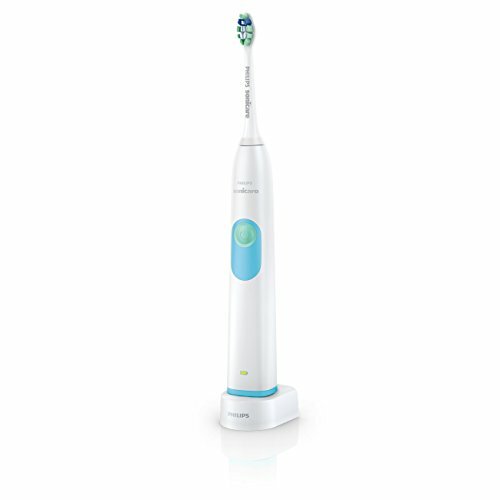 What are the benefits and drawbacks of this Sonicare electric toothbrush? Battery life – A solid 2 weeks battery life which is more than acceptable at this price. Timer – Built in quadpacer and 2 minute timer. Clean – It offers up a really good clean that can deliver up to 6x more effective plaque removal. Features – Automatic power off and the easy-start programme are premium features. Pressure sensor – No pressure sensor to alert you when brushing too hard. Battery technology – Uses a less desirable battery technology. The 2 Series electric toothbrush has a pretty conventional look to it. Made up of 2 parts the handle and the head the two are detachable. The handle is a slightly squared cylinder shape with a fairly plain design and not many buttons or controls on the handle. In this review I am looking at the White/Blue color option which is a bit more conventional and clinical looking. The handle is smooth to the touch, but not so smooth you feel like the handle will slide out of from your hand. On the front of the handle is a power button, which on most of the 6 brush colours is a Mint Green colour. On this model it is then surrounded by a Blue panel of plastic, making it stand out against the White body. Towards the bottom of the brush handle is a small battery icon that flashes when charging and gives feedback on the remaining power. On the back of the handle in the centre are a series of raised dots, this form gripping points to which the fingertips naturally fall and use to get a better hold of the handle. The base of the brush handle is flat, with a small round recess going up into the middle. This is the recess into which the prong on the charging stand fits into. This base panel is actually Blue in colour on this model and adds a contrast to the White brush body. At the very top of the brush handle protruding from the centre is a metal prong which feeds up and out of the handle from the brush motor, this is the part that drives the brush head when it is attached. Included in the box is a single ProResutls brush head. This is one of a range of brush heads available from Sonicare. It is the standard sized head, but smaller, compact versions exist. All of the brush heads are interchangeable, so although you are provided with a ProResults Plaque Control brush head, if you prefer the DiamondClean head, you can purchase and swap them out. Simple to replace the brush head just pushes on and pulls off the top of the brush handle. You should replace the brush head every 3 months as standard for the sake of your teeth and oral health. If you notice that the bristles have frayed or split then you should do it sooner. It is easy to forget when you changed the brush head last, so to help the heads themselves have something called indicator bristles. Blue in colour over approximately 3 months the bristles fade to a pale Blue almost White colour. Take a look at these and if they are pale it is likely time to replace that head. With the brush head fitted, press the single power button to turn the brush on. The brush begins in the one and only ‘Clean’ mode available. This runs for 2 minutes in total. As soon as the brush is powered on the handle begins timing the clean. You know you should brush for 2 minutes, so the handle keeps track of this and will at the end of the 2 minutes automatically turns the brush off for your convenience and to signal the time is up. As part of this timer though there is a much desired quadpacer, something that is missing on the cheaper Sonicare Essence. The quadpacer kicks in at 30 second intervals. A slight pause in the motor causes the bristles to stop moving and the sound of the brush to change. This is an alert to move the brush from one quadrant to another. There are 4 quadrants to the mouth, top right, top left, bottom right and bottom left. The idea is you spend 30 seconds cleaning each quadrant to give a roughly equal clean around the mouth over a 2 minute time period. I believe this is massively underrated and can really help you improve how good you are at cleaning your teeth. The automatic power off is a nice touch and helps conserve battery life, to ensure it can achieve the 2 weeks usage time. The clean offered by the brush is very good. It’s a relatively soft cleaning experience, Oral-B brushes tend to feel a bit more aggressive and harsher, which is actually my personal preference. 31,000 movements per minute are delivered via the brush head. Skimming the surface of the teeth and gums, studies have revealed that up to 6 times more plaque can be removed with this brush in comparison to a manual one. Subsequently you mouth will be a lot healthier, your dentist will be pleased and you will likely feel better too. Compared to a manual toothbrush, this is a bit different and the more consistent power can take a little while to get used to. Thankfully Sonicare have you covered with an innovative feature called Easy-start. Essentially for the first 14 cleans, the speed of the brush motor gradually increases until it reaches full power. This means that in the first few uses where you are not used to the power you are actually enjoying less movements per minute to ease you in. It is a small touch but it can make all the difference.It is however something you might expect on a much more premium priced brush. The handle itself is water-resistant and can withstand toothpaste, saliva etc. It can be rinsed under the ta, get wet in the shower but do avoid submerging the handle. One thing that is missing from the brush for me is a pressure sensor. Now to be honest I am being a it picky here, but a common issue is people brushing too hard. Brushing too hard wears away at the soft gum tissue and in time leads to gum recession. A pressure sensor is tool that can help alert you if you are brushing too hard and help avoid this happening. Sadly the Sonicare 2 Series does not have this. On the whole Sonicare are one of the best quality electric toothbrushes that not only feel solid and perform well, they tend to last. The 2 Series comes with a 2 year warranty should the worst happen. Register it online and you get an extra 6 months for free. My experience has taught me that different user have different expectations of the battery life of a toothbrush. Some want it to have a very good battery life and not require charging all that often, whilst others don’t worry if the battery life is just a few days, because they leave it on or it will always be near a charger. My personal view is that a battery should last at least a week, preferably 2 or more. I use this as my target as I like the idea of being able to go away on a trip for a week or two and not have to worry about taking the charger with me. The Sonicare 2 Series offers a respectable 2 weeks of battery life. Built inside the brush handle and not user removable or replaceable, the Nickel Metal Hydride (NiMH) battery recharges via a charging stand that is included in the box. The handle sits on top of the charging stand that connects to mains power. It can take up to 48 hours to charge the brush handle fully. The battery indicator on the brush handle will flash green until it turns a solid green to indicate it is charged. The charging stand itself is white in colour has a 2 pin US plug but works on voltages of 110-220v. When not on the charger if there is a yellow battery level indicator on the brush handle, this means there is a low charge, whilst green indicates a high charge. The battery indicator turns off when the battery is between a high and low charge. When you hear 3 beeps and the battery indicator flashes yellow, this means the battery level is at 10% and should be recharged. Some may criticise the use of a NiMH battery. It is a tried and tested battery technology but the newer Lithium batteries are better as they tend to have longer working lives and handle repeated charging better. The 3 Series onwards within the Sonicare range offer Lithium. Do not let the NiMH battery put you off, many brushes still use this battery type. Our testing confirmed the 2 weeks of battery life. From a full charge we managed 56 minutes of usage time which is 14 days based on 1 user cleaning their teeth twice a day for 2 minutes. I am convinced that the automatic power off feature helps conserve the battery life as power is not wasted post clean. As you probably know, most products have a recommended retail price (RRP). Quite often, many stores will sell the product at this price, however nowadays more and more retailers compete for our business and they do this by dropping the price. This means we can often get the same product for less, and the 2 Series electric toothbrush being reviewed here is no different. Priced at £$69.99, you can buy it for around $40 which is about 40% off the original price. We included a live price comparison here at the start of the review. In the box you get the brush handle and a single brush head. Brush heads need to be replaced every 3 months, if you did not know, so you need to factor brush head costs into the overall cost of ownership. A Sonicare brush head varies from about $6-10 subject to the head, pack size and retailer. This gives an average cost of around $8 per head. An electric toothbrush has a typical working life of 3-5 years. Here at Electric Teeth we work out an approximate ownership cost to allow you to compare this brush to other models. Using the $40 cost for the brush handle and factoring in $88 for replacement brush heads, the Sonicare 2 Series costs $128 over 3 years or $0.12 cents per day to own. This does not include the water, toothpaste and electricity required to use this brush. Sharing the brush handle (but changing the brush head) will help extend the value from the handle and of course if it lasts for more than 3 years, the cost goes down too. Considering the competing models around a similar price point to this, this is a very good value option. Here at Electric Teeth HQ, we like to ensure we really test the brushes we review. We go hands on, get up close and use them to brush our teeth. We use them like you, your brother, sister, mom, dad or great aunt might! Should we notice any faults or everyday usability issues we will do our utmost to let you know about them in this review. Specialist stress or testing equipment we do not have, so there is no lab testing here. We are just everyday users like you, the only difference being, we have used a fair few more electric toothbrushes! A slightly older battery technology is used within the handle so this could be a potential longer term weakness but used on electric toothbrushes for many years, there is no reason to be overly concerned. The good news is that Sonicare are really reliable on the whole and rarely are problems encountered. Pretty much perfection right here, the 2 Series from Sonicare is an excellent toothbrush. It might not have a pressure sensor and it might use an older style of battery but I am splitting hairs really in the scheme of features and performance for the price. A well rounded electric toothbrush that includes features that just make for an effortless transition and effortless everyday use. If you want a superb everyday toothbrush, without all the extra cleaning modes and connectivity, then this is it. This said, since launching the ProtectiveClean 4100 has hit the market and in our opinion now offers the better all round purchase, thanks to the inclusion of a pressure sensor and brush head replacement reminder system. Is the Sonicare 2 Series an oscillating brush? What cleaning modes does the 2 Series have? It has just 1 cleaning mode, referred to a ‘Clean’. The Sonicare 2 Series comes with a ProResults brush head. 1 is supplied in the box. There are a variety of other head styles you can chose from including DiamondClean, InterCare and ProResults Gum Health. Many of which come in either a standard or compact size. Does the 2 Series have a pressure sensor? Does the 2 Series have Bluetooth? Does the Sonicare 2 Series come with a warranty & how long is it? If purchased new from an approved retailer the 2 series will come with a 2 year warranty which can be extended by a further 6 months in total if you register the brush online at Sonicares website. Does the 2 Series have a built in timer? The battery lasts up to 56 minutes, which if used on the standard clean mode, this is 14 days based on 2 cleans per day. Yes, a charging station is included with the Sonicare 2 Series. Can I use the 2 Series in the shower? Yes. The 2 Series is water resistant so if you choose you can use it in the shower. Let us know what you think about this brush and let others who may well be considering purchasing one know your opinions before they do. !